Today, most of what we use is machine made. This is useful, and also quite functional. Machine made dinnerware stacks perfectly. Designs in clothing and home decorations repeat “just so” from identical item to identical item. You always know what you get when you buy a replacement or addendum to something you bought before or from a company you’ve bought something from before. Perfectionists can find their mass producers, buy only from the, and be happy. Handmade work would make a perfectionist unhappy. There could be a bump in the glaze, a slub in the fabric or a shadow in the print even in the best quality pieces. I am a potter and I know this: no two things are ever exactly the same, even if they come pretty close. “Identical” mugs might vary by a quarter of an inch in height and half an ounce in volume. Platters might not be quite flat- there may be a curve in the wall where you did not expect it, say, or a slight lift in the floor of the piece incurred in the drying and firing processes that changes the look of the piece. My very first semester in college, long ago, a boy in my class had this idea: what if each thing is perfect? What if, in what we perceived as its imperfections, a thing was perfectly and completely itself? What if our fellow humans could accept that premise? That idea could go for people, too. There would be nothing other than everything being perfectly itself, which is a form of perfection. I don’t buy this idea exactly (what about cruelty? Negativity? Animosity? Can you call those perfect? ), but when it comes to the handmade object, I believe there is truth in it. This handle lifts a little taller and this one comes outward a bit more- which is perfect? 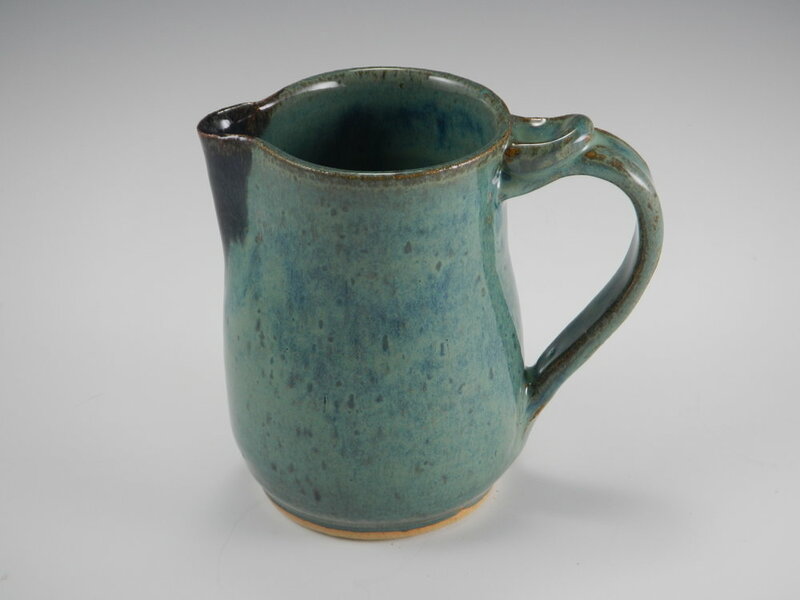 This creamer rocks a little because of its construction, and this one stands solidly but lacks the curve of the other. Which one is perfect? None? All? What it comes down to, for you and me, is this. There is beauty in many objects. Part of the beauty comes from the harmony of its parts. Part comes from its ability to function in some way. Part comes from its individuality; part is from your ability to recognize it as the object it is; part comes from its foreignness or novelty, and part from its homespun quality. If I didn’t love pottery, in its many aspects, I wouldn’t be spending my life making it and teaching it in my studio. I would have gone into a more mainstream and perhaps more lucrative line of work. I had my eye on publishing as a career, back in the day. But life intervened. And I found my way. We have plenty of room today to find and use handmade objects, to complement the machine made most-everything in our lives. Handmade objects are here that help diversify our tables, homes, and clothing. I recommend that every once in a while, if you can, you buy at least one handmade thing because you love it, and for a change, be less frugal about the cost. Handmade is not perfect. Instead, it is different from whatever else you own and use. Someone made it with care in eye, hand and mind. Choose well, choose what feels right to you, and you will love it for a long time. Posted on April 4, 2018 by Mimi Stadler.